Toontrack's simplified version of their flagship DFH Superior offers fewer kits, but with the same sound quality and in a more user-friendly interface. Toontrack were amongst the first companies to provide really good multisampled acoustic drum-kit sample libraries (specifically Drum Kit From Hell), with both dry and ambient sounds that could be mixed to give the required degree of liveness. Since then they came up with DFH Superior, an excellent-sounding drum-sample-based virtual instrument that was probably less successful than it deserved to be, because its user interface was perceived as being rather complicated. In the light of competition from the likes of FXpansion's BFD and the rather more abstract Stylus RMX from Spectrasonics, Toontrack set about developing a simpler, easier drum kit virtual instrument, and the result of their efforts is EZ Drummer. EZ Drummer requires a minimum spec of an Intel Pentium III or AMD Athlon 1.8GHz PC with 512MB RAM running Windows XP, or an Apple Mac 1GHz G4 running Mac OS 10.2.8 or higher with 512MB RAM. AU and VST plug-in formats are supported, and authorisation is via the familiar challenge-and-response system. 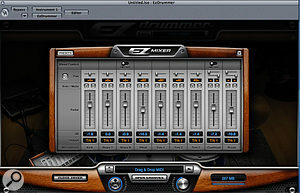 While the user interface is extremely simple, the samples are of the same quality and range as those in DFH Superior, but with a narrower choice of drum sounds. All the drums for this instrument were specially recorded at Avatar Studios in New York. Toontrack's own TPC II data-compression system is used to fit over 7000 sound files at 16-bit, 44.1kHz (equivalent to 5GB of uncompressed WAV files) into only 1.5GB of hard drive space, and they've also included a huge library (more than 8000 files) of very usable MIDI drum grooves and fills that can be dragged and dropped directly into a sequencer's arrange page in much the same way as is possible with Spectrasonics' Stylus RMX. A Humanize button adds slight variations to give the patterns more of a 'played' feel, and the velocity response of the whole kit can also be controlled by a single knob to adjust the playing feel. Grooves and fills can be auditioned direct from the MIDI-file browser, and the arrangement is very logical, making it simple to pick out variations on the type of rhythm you want, as well as suitably styled fills. Another nice touch is that you can store your own rhythm MIDI files in the library, so if you've bought some of the excellent Twiddly Bits MIDI rhythms (or something similar), you can now access and audition them much more easily. The drum kit mapping is preset to the GM standard, with some duplication on otherwise unused keys to help with two-handed playing, and there's a choice of using the plug-in with a stereo output or up to seven separate stereo outputs. Separate and main stereo outputs can also be used together, so you could, for example, keep most of the kit as a stereo mix, but isolate only the kick and snare for further processing. As with BFD, there's now a much more visual mixer that allows for the level adjustment and panning of the close mics on the drums, plus separate control over the overhead mic level and the stereo room-mic level. Mixer presets are available for fast changes in kit sound, and bleed between mics can also be switched on or off for the snare and overhead channels. However the ability to tune or damp the drums has been removed for the sake of simplicity. 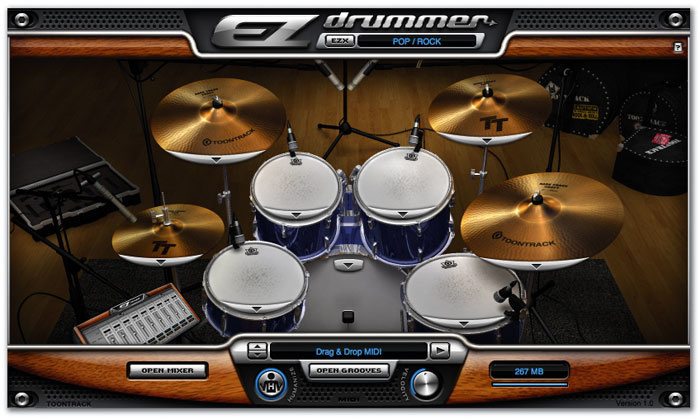 The architecture of EZ Drummer allows for expansion kits to be added at a later date, and the Cocktail Kit that came with DFH Superior is included as standard. This has a wonderful light jazzy feel that contrasts nicely with the main pop and rock kits. 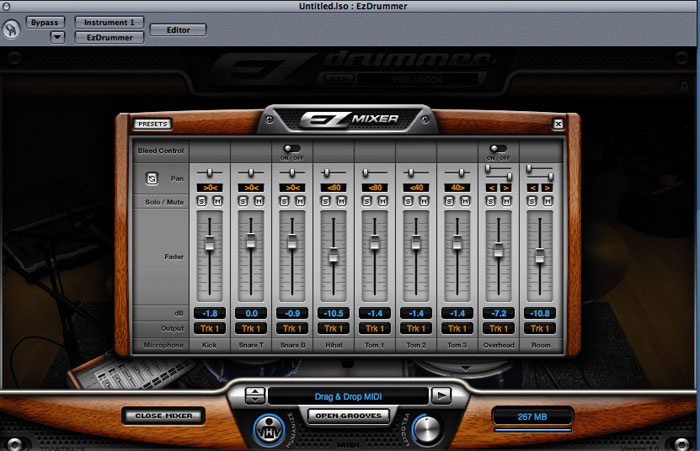 When an expander is loaded, the drum kit in the display changes to reflect the contents of the expander. Further expanders are planned for around September, and the original DFH will also be turned into an expander. According to Toontrack, if there seems to be a demand, specialist percussion expanders may be added later. The new visual mixer window makes it simple to balance the kit sound. Although the range of drum sounds is a little limited, what you get comes pretty close to the kind of drum sound I tend to strive for anyway, and by switching the snare drum and/or the kick drum and adjusting the amount of room and overhead mics in the mix, you can get anything from a general-purpose miked acoustic kit suitable for most pop styles to a fairly brash rock kit. The quality of the samples is excellent, with no obvious truncation and plenty of velocity levels, and this extends to the Cocktail Kit, which should fit in well with any contemporary jazz or Latin-influenced pop compositions. The sounds also work well when triggered from an external electronic drum interface such as Roland's V-Drums. As to the user interface, that is now as simple and intuitive as you could hope for, and the only thing I think might usefully have been added is the ability to add swing to the rhythm patterns before dragging them into your host sequencer. Having said that, most sequencers will allow you to add swing to your MIDI parts retrospectively, so it's not an insurmountable issue. I also think it is worthy of special note that the vast majority of the MIDI drum rhythms are sensible variations on the 'bread and butter' drum patterns that most of us use most of the time, so you shouldn't have trouble getting them to fit your songs unless you're into writing in weird time signatures or using odd rhythms. And if you are, then there are always third-party MIDI drum loops that you can use with EZ Drummer. Given its low cost, great sounds, and ease of use, I can't see how EZ Drummer can fail to do well. There are no obvious direct alternatives for EZ Drummer, as most other drum virtual instruments are either philosophically different or more complex. FXpansion BFD probably comes the closest in terms of approach, but also check out Glaresoft iDrum, Submersible Music Drumcore, and Steinberg Groove Agent 2 if you like the idea of a drum instrument that also includes rhythms. Comes with a relatively limited range of drum sounds. This simple and effective plug-in instrument provides a small but well-targeted range of studio-quality drum sounds along with a very usable library of MIDI drum rhythms and fills. It is easy to use, inexpensive, and can be expanded.